My comments are from the perspective of a former air attache to the U.S. embassy in Damascus, whose job it was to keep tabs on the Syrian Air Force - their level of combat effectiveness, readiness, training, pilot skills, etc. Of course, the Syrians wanted almost nothing to do with me. They, as many countries around the world, regard attaches as nothing more than intelligence officers - well, yes, we are accredited by our intelligence services and present our credentials to the host intelligence services. In Syria, being an American (or many of my fellow Western colleagues) attache meant being only invited to the monthly military attache "hail and farewell" dinner at the Syrian officers club, and attendance at the graduations of the four military academies: army (in Homs), navy (in Latakia), air force (at Rasn al-'Abud air base) and the women's military college (Damascus). 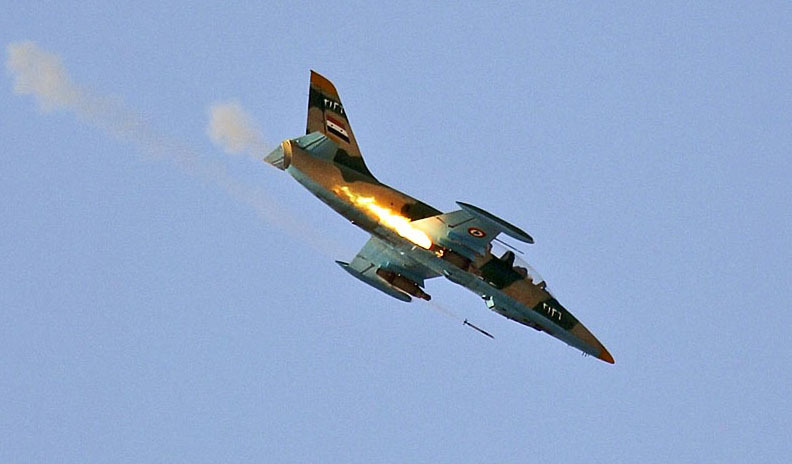 The photograph above is one of the better shots of a Syrian Air Force Czech-built L-39ZA/trainer-light attack aircraft (taiil number 2136) conducting attacks in the city of Aleppo. For anyone who has been to Aleppo, it is hard to contemplate air, armor and artillery strikes on one of the world's most historical cities. I identify the aircraft as a Czech-built L-39 only for accuracy - much of the media have reported them as "Russian MiGs." Most of them were delivered years ago and do not reflect the Czech Republic's relationship with Damascus. The L-39 is a great aircraft and I am sure the Czechs are not pleased to see it in these photographs. The L-39ZA is a trainer jet - the Syrians have several squadrons of them in the Aleppo area - that can also be used a light attack aircraft. It has four pylons on the wings to carry an assortment of armament, as the Syrians have amply demonstrated. What we see here are rocket pods, although the aircraft can also carry bombs and machine guns. As someone who has followed the Syrian air force for almost four decades (yes, I am that old), I have to say that I am impressed with the the service's effective use of the L-39. Many of my colleagues have asked why we have not seen the more capable fighter and attack aircraft of an air force that was meant to go up against the Israelis. The Syrian Air Force possesses the later-generation Russian-built Sukhoi-24 (NATO: FENCER) fighter/attack aircraft, yet they have not been seen in action. Actually, for the type of operations being conducted in the Aleppo area, as well as the rest of the country, the L-39ZA is the best fixed-wing asset in the Syrian air force inventory. It offers excellent visibility for the pilots, can carry an adequate amount of weaponry, and flies slow enough so the pilots can pick out their targets in the dense urban environment of Syria's large cities. It also leaves the SU-24 fleet in reserve for other operations. Should Bashar decide to use chemical weapons, we may see the SU-24s called into action. In concert with the L-39s, we have also seen the Syrians use the Mi-8/17 (NATO: HIP) assault helicopters firing machine guns and rockets, and even dropping bombs. We have also seen them use the feared, very capable, heavily armed Mi-25 (NATO: HIND) gunships. Someone at Syrian air force headquarters knows what he is doing. Given the nature of the threat and the type of fighting, the right aircraft are being used. We might not like what they are doing, but they are being effective in doing it. * Many people are surprised to learn that women are part of the Syrian armed forces. Syria is a secular state, and women serve in the military. As I said in the article, many of them are utilized as Hebrew-speaking intelligence officers. Syrian astronaut defects - who knew?